Tonight I will give a tallk on “Fukanzazengi”. Tomorrow starts the 5 day sesshni, and on the last day of sesshin Jinen-san (J), Yoshin-san (AUS) and Hakue-san (Mexico) will receive lay ordination. In the evening, if the waether is fine, we will have a camp fire. See you again on the 6th! After the “jikido rehearsal”, we strolled around the hall and found Shoko and Jisui working as always in the Northern garden. Shoko, who designed the garden, explains something about planting Camelias in German. Discussing the area and content of the activities of the group with group leader Eko-san. For the neaxt three years, we will tryt o clean up the forest surrounding Antaiji but cutting dead trees and removing the spreading bamboo. Trying to decide what needs to be done first and which our preferences are for the tools we buy. Last day of the yoga event in Hakone. In the morning, I sat zazen with two ladies from Germany at the lake in Hakone, and from 10:30 I gave a talk on bodhi-mind with about 15 Japanese participants attending. Because it was done on a pier on the lake, the right side of my face was burned like a toasted bread. At around half past 5, I was back at the airport in Tottori and drove the light truck back to Antaiji. Whenever I am in Tottori, I check for nuka (rice powder) at the automatic rice polishing machine in Iwami. If you insert coins in it, this machine will remove the rice husk and polish it. You can choose between “50%”, “70%”, “normal” and “super white”. As Japanese normally do not eat unpolished rice, you do not have the choice of “brown rice”. Therefore, when we have to remove the husk of the Antaiji rice, we have to visit a special store in Hamasaka that will not polish the rice. When you polish rice, you loose the outer part of the rice corns, which is collected in the “nuka house” on the left side of the machine. Because it is harvesting season, I was able to collect 8 full bags, which will be used for fertilizing the fields as well as food for the chicken. From the gondola we got our first glimpses of Mt. Fuji. How great must it be to see him in the evening sun, from the top of the mountain? 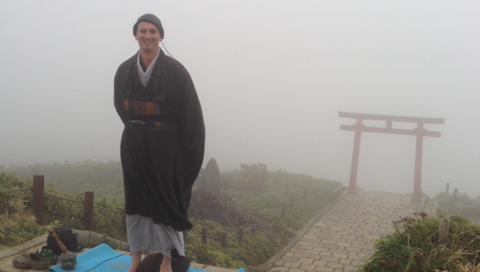 The second we reach the mountain top, we are in a thick mist. It is cold and a strong wind is blowing from the East. Without MINI’s support, people would have asked for their money back. as it was a free vent, people even got a free yoga mat. Anyway, you do not always get want you want. Especially not from your Zen practice. Today was a good opportunity to accept things as they are, rather than tayloring them according to our wishes. They say that this place has been a “power spot” for 2400 years. Actually, I do not really believe in “power spots”. Or rather, for me any place where zazen is done is a power spot. Even today, in this weather, the mountain top was a power spot. Tomorrow I will give my last talk on Bodhimind on this pier. After that I will fly back to Antaiji. From the mountain top, tomorrow we will have a great view of the sun setting behind Mt. Fuji. In the afternoon, we had the opportunity to site by the lakeside. Got up early than the sun, as always. 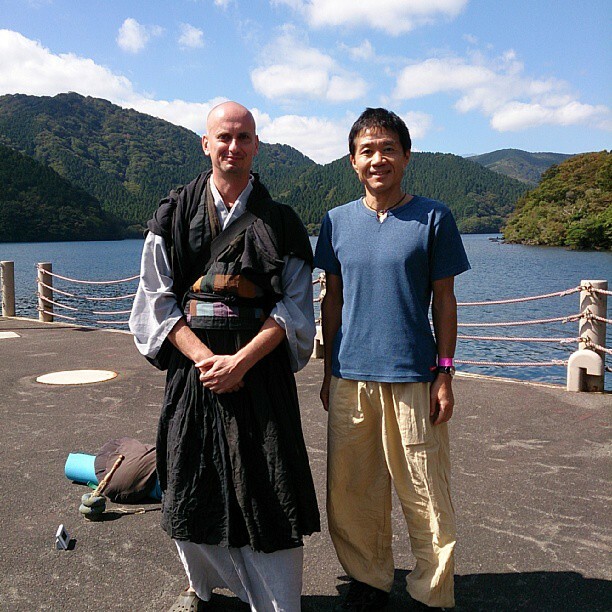 Following the Antaiji schedule, I did a little zazen and then went out to the lake, where Mt. Fuji was lit up by the sun. Today will be the first day of the three day “True Nature” yoga event. 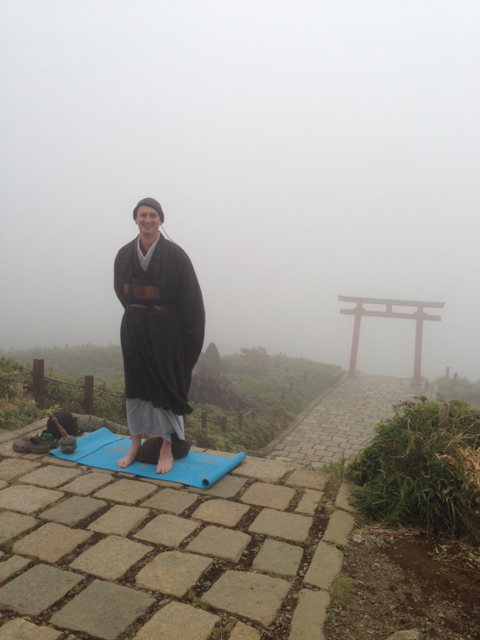 I will be leading zazen workshops at a yoga event in Hakone on the 27th, 28th and 29th. The true “TRUE NATURE” event takes place in a hotel close to a beautiful lake. Starting from tomorrow, we will be sitting at the shore of this lake. On a clear day, you can see Mt. Fuji from here. Takeo official starts to train as tenzo in the kitchen. His plan for the first day is – pound cake! Today was another one day sesshin. The day begins with the jikido, who is responsible for the meditation hall, waking up everyone in the sangha at 3:45. He strikes the drum three times, followed by three strikes of the unpan (metal board). After this, he will run down the corridors with a bell. Not only is he to wake up everyone, but his vigor is to motivate the rest of the community. What the hidden camera in Antaiji caught this morning was not exactly a good example.